Q:Originally from Tokyo what are some of your favorite things about living and working there? A: As the capital city of Japan, it has many interesting museums, shops and restaurants. One of my favorite things about living in Tokyo is that you can enjoy the cuisines of many different countries. A:I am not sure if I can call it a sketchbook, but I keep a notebook, which is basically for ideas, thumbnails and memos. I always start with thumbnail sketches with my favorite ballpoint pen, but after that I totally go on to the screen. I don't make any drawings to scan as a base for the final artwork. Instead, I start drawing on screen using a Wacom tablet, once I have decided the direction. Q: What do you like best about your workspace? A:I like that my studio is very close to the train station. It is located right in front of the station platform, just a minute’s walk to the ticket counter. It is very easy to tell people how to get to my studio for a meeting. The Day of the Jackal, The Folio Society, AD: Sheri Gee. Q: Do you think it needs improvement, and if so, what would you change? A:I think my workspace is fairly organized, but the number of books increases day by day. My book shelves are almost full, and because there is no room for a new book shelf, I would have to get rid of some books to keep the shelves in order. The books I have are basically my favorite art books or books that include my illustrations, so it's very hard to determine which ones I could give up. A:It might sound rather too ordinary, but I would have to say it's hard disks that archive 20 years of my work. If my computer goes down, I can always buy a new one, but if my data is gone, I can never get it back. Q: What is your favorite part of the creative process? A:Whether conceptual or narrative, I love making rough sketches, in color. I feel I am most free and quick and alive at this stage of a project. When I get to executing a final, I become a bit stiff in some ways. This is because I am a perfectionist, and tend to tighten up everything too much. I love the fact that rough sketches are allowed to look rough. Q: What was the strangest or most unusual assignment you’ve taken? What did you learn from the experience? A:I was once asked to do an illustration for an advertising agency, of a cemetery in Japan. They wanted me to illustrate a family who was visiting the cemetery. They wanted me to fill the ground with a lot of colorful flowers. You know, my work has textures that look like silkscreen or woodblock prints. When I submitted my final piece, I was told by the client to delete the clouds in the sky because they thought they looked like some spirits of the dead floating around. They also told me to make all the colored layers 100% opaque, and erase all the textures otherwise the family would look like ghosts. They wanted to make sure that every flower had its stem firmly rooted because they didn't want people to think what I illustrated was the afterworld, or heaven. I didn't think this was creatively interesting at all, but I learned that a project could be funny! 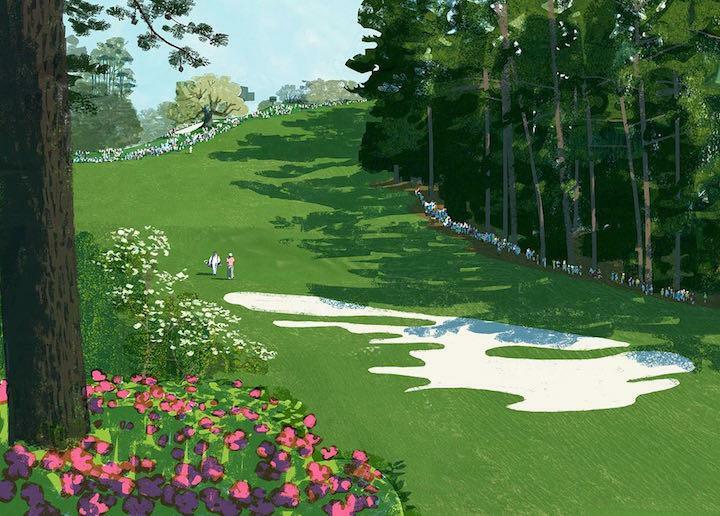 Masters Tournament, 2013,Golf Digest, AD: Ken DeLago. A:An illustrated encyclopedia, especially the sections that included insects and animals. I looked at them constantly, and drew animals and insects from the pictures. A:Taschen’s book on Utagawa Hiroshige. A:Oil paints. Before I switched to Photoshop, I used to do illustration in oils. I kind of miss that. However, if possible, I would love to do my personal paintings in oils rather than doing illustrations. Q: What are some of your favorite places/books/blogs/websites for inspiration? A:I don't have any particular blogs or websites that I check regularly, but I look through Tumblr quite often to get some ideas. I am also a big fan of eBay. I love vintage junk, and one of my pleasures during my art school years in the United States was treasure hunting at flea markets on weekends. Because there are not so many interesting flea markets in Japan, I now do my treasure hunting on eBay. My studio is full of those vintage junk items. A:It was a Communication Arts illustration annual that gave me the thunderbolt. When I was in Japan, before going to the U.S. to attend an art school, I didn't know anything about those illustration annuals including American Illustration or the Society of Illustrators annual. Without knowing anything about them, I happened to grab a Communication Arts annual at a local art supply store when I first enrolled in an art school in Los Angeles. At that time, I was sure I wanted to study illustration, but I didn't really know what illustration in the U.S. was. When I flipped through the CA annual, I suddenly realized that this was what I wanted to do. Since then, getting into those illustration annuals has been one of my goals. Q: If you could be anywhere but where you are now, where would that be? A:In Los Angeles or somewhere close, like Pasadena, which I regard as my second hometown because I attended art schools there, and I had lived there for three years. Q: Where do you teach—and what do you like best about teaching? A:I teach illustration at a community school called Aoyamajuku, in Tokyo. What's most rewarding is when I know that my students have made obvious progress in their artwork in any way. Getting acquainted with someone new through teaching is another favorite part. Q: What advice would you give a young artist about applying to an art school or college? A:In most cases, when you are young, you don't even know what you want to study. So if you are really positive about attending an art school, I think it's a good sign. I would like to tell you just go ahead and do it. Learning something new is always a good and fun thing to do no matter what subject it is. So just do it and work hard. However, if you are not sure that art is something you definitely want to learn, you might want to look around. You might want to attend an university or liberal arts college to test the water and to find what you really want to pursue, which is what I did. A:Since I am Japanese, it would be a couple of onigiri (rice balls), miso soup, and Japanese pickles. Left: Le Chat Et Le Casino, MUZE, AD: Delphine Allégre. Center: Tavern on the Green, Dujour Medial, AD: Sarah Olin. Right:Gingko Tree, Japan Railway Kyushu Please, AD: Kanako Ujiie. Tatsuro Kiuchiwas born in Tokyo, Japan in 1966. A biology major and graduate of International Christian University in Tokyo, he made the switch to an art career after graduating with distinction from Art Center College of Design in Pasadena, California. Tatsuro began illustrating children’s books with several publishers in the US and Japan, eventually branching out into editorial work for magazines, book jacket illustrations and advertising commissions. Tatsuro’s first picture book,The Lotus Seed(text by Sherry Garland / Houghton Mifflin Harcourt) has sold more than 200,000 copies worldwide. He has also been commissioned by such clients as Royal Mail to design their Christmas Stamp Collection in 2006, and Starbucks for their Worldwide Holiday Promotion “Pass the Cheer,” in 2007. He has been contributing a serial comic strip titled “The Earthling,” which appears regularly in a quarterly magazine. Tatsuro is the owner of the studio, Pen Still Writes, and a member of Tokyo Illustrators Society. 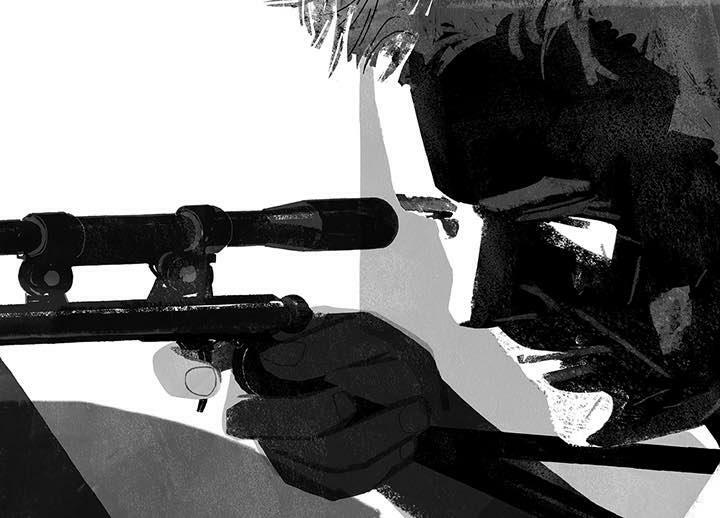 His work has been selected for every edition ofAmerican Illustrationsince 2004. He teaches illustration at Aoyamajuku.